Michael Ocelot's KIRIKOU AND THE SORCERESS shook up the animation industry in France and put the director on the map.It is there for justly acting as the opening film for this year's Animation First Festival in New York which will have the director in attendance. The story begins with the birth of Kirikou, a tiny boy who immediately ends up in the middle of the battle between his village and an evil sorceress who has "eaten" all of the men and turned off the the villages water supply. The boy must use his pluck, luck and skills to stop the sorceress and bring peace once more. Beloved by many the film it has spawned a couple of sequels, despite the film having a definite ending. Its good to know about the sequels, which are not playing at the fest, which fill in details and other adventures for Kirikou. I mention them up front because if you are like me you are going to be hunting them down soon after you finish this first film. This film is a great deal of fun. Full of witty remarks, suspense and just great storytelling this is a film that is going to become one of your favorite films, animated or otherwise.This is the sort of kids film that could have changed the thinking of a generation of film goers about what animation could be. Frankly other than the fact that the film has bare breasted women in it I'm surprised that Disney didn't make an effort to either release the film or remake it. 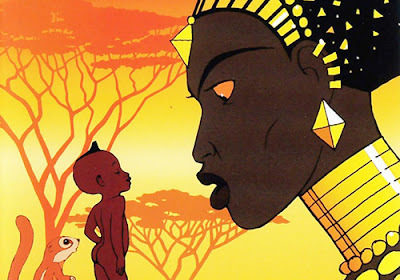 Highly recommended when it opens the Animation First Fest Friday (Ticket here) KIRIKOU AND THE SORCERESS is a classic of animation and a must see.